Arthur Carmazzi, a world renowned leadership and motivational speaker, initiated the Opening Speech at the Global Leadership Awards that was attended by an extensive pool of businessmen, industrialists, Diplomats from various countries and other ministers. Selangor’s Tengku Sulaiman Shah Sultan Salahuddin Abdul Aziz Shah was the royal patron of the event and shared the limelight with Her Highness Princess Badria Almula. 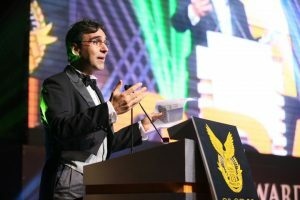 The event was organized to appreciate and reward the hard work of the industrialists from all economic arenas ranging from SMEs and MSMEs to some of the biggest MNCs in the fray.The awards night was hosted in The Royale Chulan Hotel, Kuala Lumpur on June 8. What more could one have expected from an event which was attended by dignitaries from various countries and was organized to recognize the top performers from every group. They got enlightened with the lively and humorous speech of Arthur Carmazzi who has his own style of speaking and expressing his views to make people understand the basics of everything. He gives answers to those questions which we are aware of and know the answers but never realize them. Arthur Carmazzi has co-authored many books and has been a frivolous motivational speaker. He has been a mentor, businessman, architect, writer, performer, orator and a lot other things. Having seen life from a different perspective, he has a very strange skill of seeing things differently and finding out the positivity in each and everything. People know what a leadership actually is, but they never understand its application to all parts of life. Everyone who was present in the event surely got to know more about a the importance of leadership in the iconic Arthur Carmazzi Style. He asked everyone to stand. He asked that if they have never helped anyone to achieve something that was difficult, to sit down. He went on to ask them that if they never supported people to get clarity about a goal or idea, to sit down. The next question was if they never had inspired someone to be more than they already were, to sit down. Finally Arthur Carmazzi then added that if the audience was still standing, that they were leaders, regardless of their position… they were leaders. According to Arthur Carmazzi, building a brand is not everyone’s cup of tea. It requires energy, craving for excellence and passion to improve continuously. His skill of relating even small business terms to daily human behaviour helps in making people understand things clearly. The event was organized by the ALDA Global Council and the Leaders International Magazine which witnessed around 44 awards given to the top performers and innovative thinkers who have brought changes in the business patterns and have made the market all the more competitive. The awards were given for categories including SMEs, MNCs, GLCs and others. The audience were overwhelmed with the inspirational Arthur Carmazzi and his way of explaining complexity with this ease. His opening speech set the tone for a successful global event which was witnessed by the business fraternity from all over the world. Everyone loved the way he interacted with the people around and gave insights of business terms in such simple language.